Peer victimization during youth is a frequent occurrence that negatively affects the social–psychological adjustment of children and adolescents [Hawker and Boulton, 2000]. Although it was originally thought that relatively few children were victimized, recent findings suggest that approximately one in five youths are chronically exposed to ongoing peer torment that consists of physical (e.g., hitting, pushing), verbal (e.g., threatening, insulting), or relational attacks (e.g., ignoring, shunning, spreading rumors) [Crick and Grotpeter, 1996; Storch et al., 2003]. Fortunately, as mental health professionals and school personnel have recognized the deleterious effects of peer victimization, increased clinical and research attention has been paid to addressing bullying in schools and clinical settings [Leff et al., 2001]. Theories about the negative impact of peer victimization on children’s social–psychological adjustment have been developed in efforts to understand the mechanisms through which bullying may contribute to poor adjustment. One such theory espoused by Storch et al. [2003, 2004] proposes that threatening and dangerous peer interactions create and reinforce negative self-evaluations and lead to avoidance of social interactions. The internalization of negative feedback from aggressive peers results in increased distress deriving from negative self-attributions. Providing support for this model, empirical studies have reported causal relations between peer victimization and social phobia symptoms [Storch and Masia- Warner, 2003], general anxiety [Storch et al., 2004], and depressive symptoms [Bond et al., 2001; Storch et al., 2004]. No data have been reported on the role of peer victimization in the development of obsessive–compulsive disorder (OCD). OCD is characterized by the intrusion of unwanted thoughts or disturbing images (obsessions) that are difficult to resist or the repetition of ritualistic behaviors (compulsions). Compulsions may be carried out to prevent harm [Salkovskis, 1999] or to relieve subjective feelings of distress. That obsessions and compulsions may be elicited vis-a`-vis peer victimization is not surprising. Obsessions about specific bullying events may be intrusive and distressing to the child, and of an uncontrollable nature. Compulsions may develop through coincidental or perceived associations between performing a ritual and teasing related stimuli. For example, a child might inaccurately link a behavior carried out the preceding day with reduced peer victimization on subsequent occasions resulting in the performance of this behavior in an effort to reduce future bullying occurrences. Alternatively, negative peer experiences may contribute to the development of inaccurate cognitions about responsibility or harm resulting in feverish attempts to determine a manner of countering bullying. This report describes an adolescent boy’s experience of peer victimization and its relation with his development of OCD. 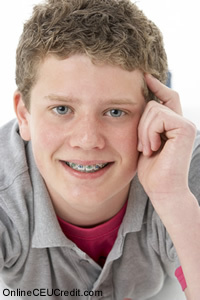 Max, a 14-year-old Caucasian male, was referred by his psychiatrist for intensive cognitive–behavior psychotherapy for OCD. Max reported that his symptoms started approximately 2 years before treatment when he was being bullied at school about his physical size, sexual orientation, and attractiveness. At symptom onset, Max engaged in only one ritual, which was to go home after being bullied and immediately take a shower. The shower served to reduce his overall level of anxiety by ‘‘cleansing’’ himself of the bullies’ remarks. With time, Max began avoiding wearing clothing that he wore on days he had been bullied because the clothing was ‘‘contaminated’’ by the insults. Avoidance of ‘‘contaminated’’ objects and situations expanded to include places (e.g., his living room, the dining room table, the family cars) and objects (e.g., a blanket on the sofa that he would use when studying) that were perceived by Max to be linked to bullying experiences. Max’s use of rituals also expanded to include clearing his throat when he had a thought associated with bullying, as well as re-starting activities (e.g., reading a sentence, washing his hands, or getting dressed) whenever he had a bullying-related cognition. Notably, these thoughts were pervasive throughout the day and severely incapacitated Max’s ability to engage in age-appropriate self-care, social, and academic behaviors. Shortly, Max refused to attend school or engage in school-related activities due to distress associated with being peer victimized, as well as the impairing nature of ritual engagement. Not surprisingly, he also avoided activities, such as getting his hair cut, going to church, and going out to dinner with his family because he felt he might encounter people who would bully him. Further, rituals and avoidance of objects and situations associated with bullying significantly restricted Max’s activities within the home. For example, Max had not showered or changed clothing for 32 days due to the effort of grooming (e.g., showers took up to 6 hr) and distress related to wearing clothing associated with bullying nor had he slept in his bed because he connected stimuli in his bedroom to past bullying events. Max participated in twenty 90-minute individual psychotherapy sessions over a period of 4 weeks. Treatment followed the cognitive–behavioral therapy manual outlined by March and Mulle , focusing on exposure and response prevention (ERP) to obsessions and rituals, as well as developing cognitive restructuring skills. Initially, Max and his family were educated about the nature of ERP, namely that his anxiety would habituate after repeated exposure to compulsion provoking events without ritual engagement. A hierarchy of distressing situations was established thereafter, and Max was progressively exposed to situations or objects that he rated as moderately anxiety provoking (e.g., wearing clothing that were linked to bullying experiences) while refraining from ritual engagement. As his anxiety habituated within these early exposures, Max was further exposed to situations that he rated as highly anxiety provoking. In each instance, Max was coached to continue with the exposure exercise until his subjective arousal decreased significantly without using anxiety-reducing rituals. At the end of this treatment component he participated, in vivo, in exposure to situations that he rated as highly anxiety provoking at the initiation of treatment, such as going to a mall and initiating social interactions with children his age. To address his concerns about peer victimization upon returning home and eventually returning to school, Max was provided with a number of cognitive and behavioral coping skills. These skills were designed to reduce the frequency of negative peer interactions and provide Max with cognitive strategies to minimize distress experienced when inevitably he would be bullied [Storch and Masia-Warner, 2003]. The rationale given to Max and his family for these interventions emphasized the importance of minimizing exposure to negative peers and enhancing ways of objectively evaluating the interpretation of and motivation behind peer attacks. To this end, Max’s problem-solving abilities and assertiveness skills were improved to minimize his exposure to interactions with a high probability of being bullied. For example, he worked with a teacher after school so that he would avoid taking the bus, a place where frequent bullying occurred. Further, Max learned how to reframe peer attacks in an attempt to depersonalize insults. For example, if harassed by a peer, Max was able to objectively evaluate the validity of insults resulting in moderately less distress. Finally, with Max’s agreement and his parents’ assistance, Max was connected to several local child centers where he was able to cultivate satisfying friendships. Having friends has been found to be an effective buffer against experiencing distress related to peer victimization by providing emotional support or physical protection [Storch et al., 2003]. Because of the location of our facility (several hours away from Max’s hometown), Max was only able to engage in exposure to the most anxiety provoking situations on weekends (e.g., spending time in his neighborhood and at his school). It was also difficult for his family to travel to the treatment facility on an outpatient basis due to the distance. Thus, he was referred to a therapist near his home for follow-up outpatient treatment. At 5-month follow-up, Max continued to make progress. He was sleeping in his own bedroom, taking showers in his bathroom, actively participating in his home-school program, and engaging in exposure exercises in his neighborhood, per direction of his therapist. Further, he was interacting with other children on an age-appropriate level and planning his return to school for the final semester of the school year. With regards to assessment, at baseline, Max’s score on the Children’s Yale–Brown Obsessive–Compulsive Scale (CY-BOCS) [Scahill et al., 1997] was 35 indicating severe OCD, and his scores on the Children’s Depression Inventory (CDI) [Kovacs, 1992] and Multidimensional Anxiety Scale for Children (MASC) [March et al., 1997] were in the elevated range (CDI=13, MASC=50). After 20 treatment sessions spanning 4 weeks, Max’s CY-BOCS score decreased to 12, and his CDI and MASC scores decreased to within the non-clinical range (CD=3, MASC=14). This case report is noteworthy for several reasons. First, it represents the first known report of a child with OCD whose symptom onset is associated with peer victimization. The extant literature has linked the experience of peer victimization to a number of negative psychosocial adjustment indices in youth including anxiety, depression, loneliness, and low self esteem [Hawker and Boulton, 2000]. This is an important extension of existing clinical knowledge, as it suggests that chronic peer torment may be partially related to the development and maintenance of OCD symptoms in some children. Consistent with others’ findings in large non-clinical samples [Storch and Masia-Warner, 2004; Storch et al., 2003], the case of Max illustrates how a child can internalize negative peer feedback resulting, in this case, in the development of obsessive–compulsive anxiety. On balance, it is possible that peer victimization may precipitate the onset of symptoms in a biologically predisposed individual and may even shape the phenomenology of the symptoms. Second, this case report exemplifies the importance of recognizing the impact that bullying can have on children. In a society where prevalence rates of peer victimization are as high as 20% [Crick and Grotpeter, 1996; Storch and Masia-Warner, 2004; Storch et al., 2003], bullying has often been seen by teachers and parents as a normative aspect of childhood or a right of passage. This case report highlights the importance of recognizing the potential long-term and serious impact of peer victimization. Although the current case presents as an extreme reaction to peer torment, empirical literature supports the negative impact of bullying on emotional and behavioral adjustment [Hawker and Boulton, 2000]. This report suggests the need for increased identification and intervention in settings such as the schools to decrease the potentially deleterious impact of bullying. Third, the rapid onset of symptoms after bullying is also unique. Although some adult [Rasmussen and Tsuang, 1986] and child patients [Thomsen, 1995; Tolin, 2001] experience a trauma before symptom onset, it is typically not that case that symptom development follows a trauma. Finally, this case is also noteworthy in that intensive cognitive–behavioral psychotherapy was seemingly effective in addressing symptoms. As well, Max was taught cognitive and behavioral skills to respond to bullies. For example, at follow-up he reported improved ability to respond unemotionally when confronted by an aggressive peer. To this end, some have suggested the importance of treating anxiety that may invite peer attacks when working with a patient who is peer-victimized [Storch, 2002]. This study has several noteworthy limitations to consider. Most notably, we present this case as evidence that OCD developed due to frequent peer victimization. It may be, however, that overt characteristics associated with having OCD or an anxious temperament contributed to the development of negative peer experiences. Some have also suggested the presence of a transactional model to understand the relationship between peer victimization and maladjustment [West and Salmon, 2000]. Peer victimization may contribute to the development of overt distress, which increases the vulnerability of the child for further peer torment. It is also worth noting that the evaluator was aware that Max was being treated, which may have biased his ratings. Within these limitations, however, this report is the first of its kind to document a relationship between peer victimization and OCD in adolescence. The preceding section contained information about peer victimization and the development of obsessive-compulsive disorder in adolescence. Write three case study examples regarding how you might use the content of this section in your practice.